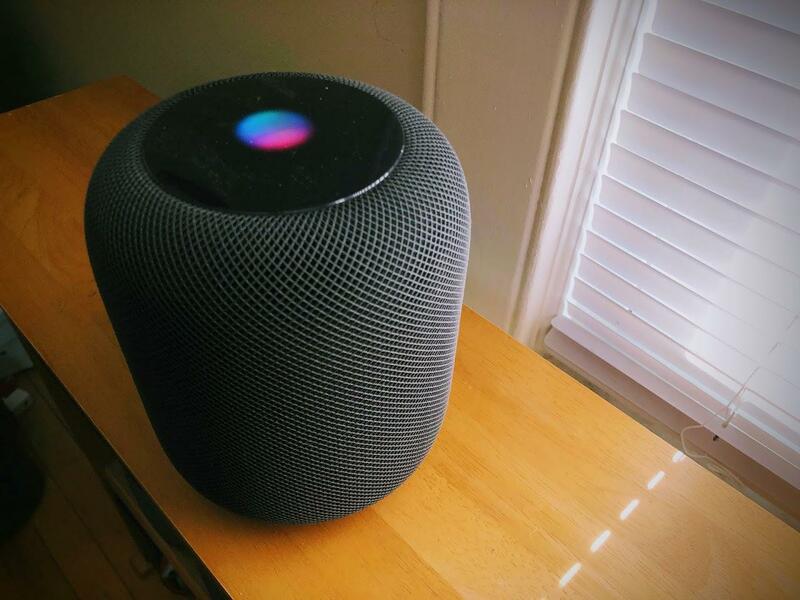 The HomePod has landed, to the delight of music fans — well, primarily Apple Music fans, for whom the smart speaker is mainly intended (see “HomePod First Impressions: Let the (Apple) Music Play,” 12 February 2018). With help from Siri, the HomePod can do quite a bit more than just play music, but it has a lot of room for improvement. I spent a few weeks putting the HomePod and Siri through their paces for a broad range of non-music tasks that include communication, personal management, and retrieval of information. For context, I compared the HomePod to the rival Echo Dot (Amazon’s entry-level Echo, with its Alexa assistant), and the Google Home Mini (Google’s entry-level smart speaker, with Google Assistant). I focused solely on utility: How did the smart speakers make my life more convenient or informed? How did they assist or enlighten me? I ignored the speakers’ associated music services. I also disregarded the role each can play in home automation since that deserves its own article. Finally, I didn’t compare sound quality since the lower-cost Echo Dot and Google Home Mini aren’t in the pricier HomePod’s audio class (the Google Home Max is more comparable; see “New Google Gear Once Again Takes Aim At Apple Products,” 18 October 2017). Information and assistance I sought from the speakers included news and weather, my agenda, non-musical entertainment such as podcasts and audiobooks, the option to make telephone calls and send text messages, and the capability to create notes and reminders. Also, to what extent were speakers able to roll multiple kinds of information into a single, convenient report? And how well did they support multiple users in a household? It was a fun challenge, and it clarified how, while the smart speaker race has a distinct frontrunner in Amazon’s Echo line, Apple’s HomePod is very much in the running, despite its late entry. For each of the categories below, I’ll award each company up to 3 points. The ranking won’t always be 3-2-1 because in some cases, a company’s speaker deserves no points at all, or may be second but deserve only a single point. These rankings are from the perspective of an Apple user; there are a few spots where Amazon’s and Google’s devices would rank better for Android users. Multiple User Support — A smart speaker should be smart enough to recognize multiple users in a household and allow them to interact with the device with their own data and accounts. The HomePod fails entirely in this sense. It does not support multiple accounts in any way and cannot identify users by their voices. That’s a problem both for the primary user if an unauthorized user begins extracting personal information from Siri on the speaker. And it’s a problem for non-primary users, who can’t get to their playlists in Apple Music, create reminders on their lists, and so on. The news is better with Amazon Echo and Google Home gadgets, both of which can be trained to recognize different voices and personalize services for multiple users. Amazon uses what it calls Voice Profiles to this end. Such profiles can be set up, trained, and deleted. They give each user access to his or her own messages, music settings, Flash Briefings, shopping updates, and so on. Hardware support isn’t complete, though. Of the current-generation Amazon devices, the Echo, Echo Dot, Echo Plus and Echo Show have the feature, but the Echo Spot does not. Similarly, Google has a Voice Match technology for shared use of its smart speakers. Up to six people can use Voice Match on a single Google Home device, and each has access to personalized info, such as commute times, daily briefings, favorite music services, and preferred video services. There don’t appear to be any restrictions on which Google Home devices can use Voice Match, which gives Google a slight edge over Amazon. Give Me the News — In addition to its primary role as a music-delivery system, the HomePod can read you the news. This isn’t surprising since Amazon and Google have made much of this capability. 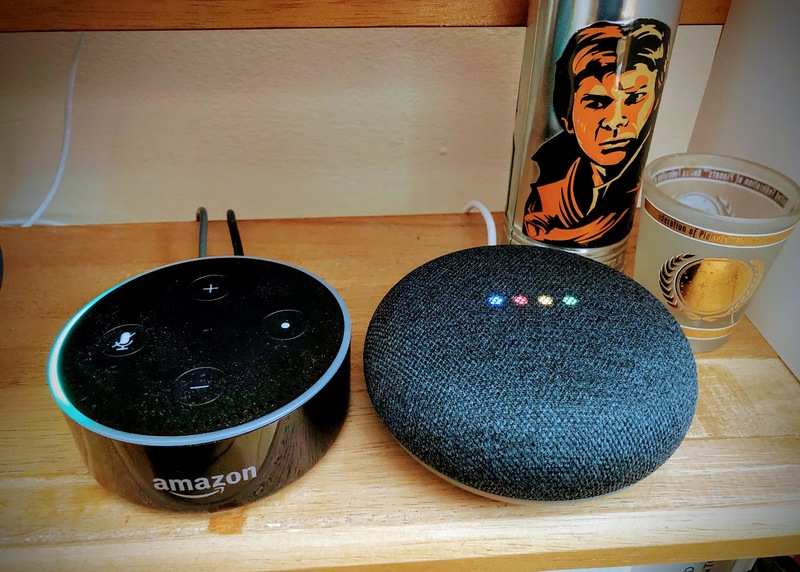 Before the arrival of my HomePod review unit, I had been in the habit of requesting the morning news from Alexa or Google Assistant using the Echo Dot and Google Home Mini in my home office. More recently, I’ve taken to asking the HomePod for the morning news as I’m getting ready for my day. This has been both satisfying and frustrating. The HomePod does reasonably well but has room for improvement. 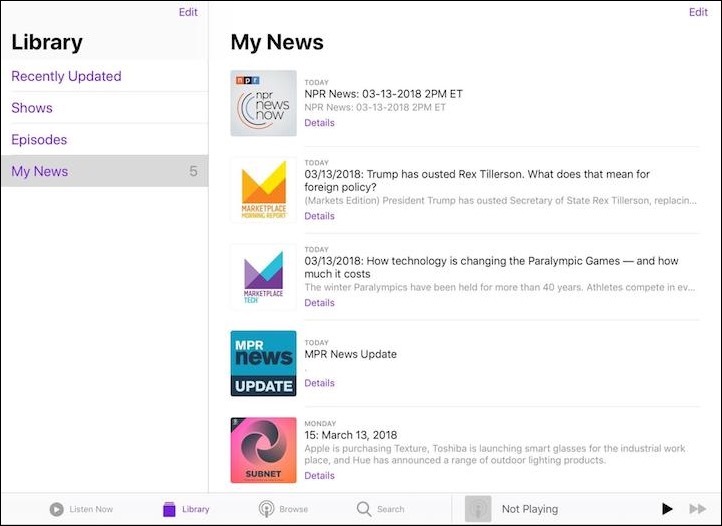 Ask Siri on the HomePod to “give me the news,” and it automatically plays a news summary from one of its news partners. In the United States, these official news sources are Bloomberg, CNBC, CNN, ESPN, Fox News, National Public Radio, NBC, and the Washington Post. If the HomePod does not give you the source you want when you ask for news, you can ask Siri to “switch to (news provider).” That media outlet becomes the default from then on. 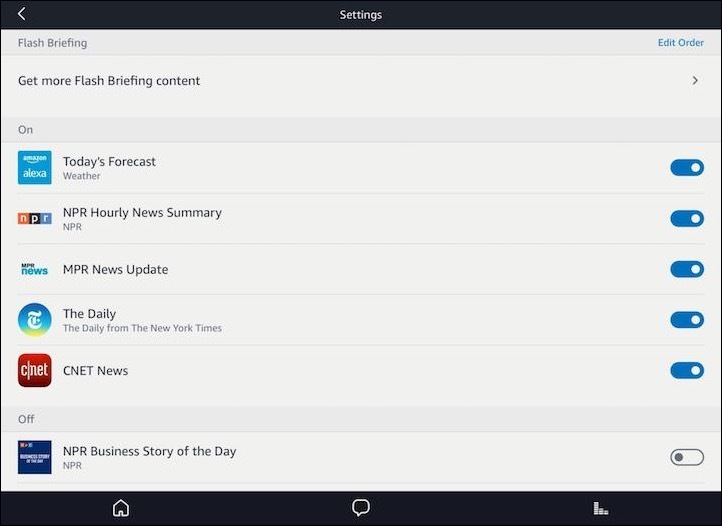 While Siri’s play-me-the-news command plays from only a single source at a time, Alexa users can set up a Flash Briefing containing a string of news sources in a particular order. Selection can be overwhelming: a search in the Alexa app finds hundreds of options. Some flash-briefing content is now in video form, too, since two of Amazon’s newest Echo speakers — the Echo Show and the Echo Spot — build in displays. If you want Siri to read from several news sources in one go, things aren’t as convenient. You have to cobble together a combo newscast manually with Apple’s Podcasts app. Specifically, you need to set up a “station” containing a series of short-duration news-related podcasts that function collectively as a single news report. Examples of such digest-style news podcasts include NPR Up First, NPR News Now, the Washington Post’s The Daily 202’s Big Idea, the BBC Global News Podcast, and for tech-news junkies, APM Marketplace Tech, Relay FM’s Subnet, and Tom Merritt’s Daily Tech News Show. Create a station in the Podcasts app, give it a name Siri will understand, and populate it with news podcasts. Then, on the HomePod, ask Siri to “play (station name).” That should fire right up and begin working its way through podcast episodes. Frustrations remain. I can’t rearrange my station’s various news sources in the playback order that I prefer, so I never know which will be at the top of the queue. The Podcasts app does have useful settings, including a toggle to prioritize unplayed content and an option to play content newest to oldest, both of which make sense for regularly updating news sources. There is one other way to get news on the HomePod: use it as live-streaming appliance — essentially a very expensive radio. If you ask for “NPR live,” Siri plays an NPR live stream via iTunes Radio. Other such live options include the BBC, Bloomberg Radio, CBS News Radio, CBS Sports Radio, ESPN (in English or Spanish), NBC Sports Radio, and Public Radio International. You need to experiment because requests for terrestrial-radio sources sometimes cough up canned content (such as podcast episodes or news summaries) instead of live streams. Apple has put some thought into how news is delivered via Siri requests on the HomePod, but its rookie effort needs polishing to match the more sophisticated news-delivery capabilities on Amazon Echo and Google Home devices. Amazon is slightly ahead of Google with more available content — and some of that content, uniquely, is in video format. Play Me a Podcast — The HomePod and Apple’s Podcasts iOS app are designed to work together, which is a great thing for podcast fans. Let’s say you’ve been a regular listener of the TidBITS podcast, which provides audio versions of TidBITS articles, read by the authors. Playing it is easy; just ask Siri on the HomePod to “play the TidBITS podcast,” and the show’s most recent episode will begin. 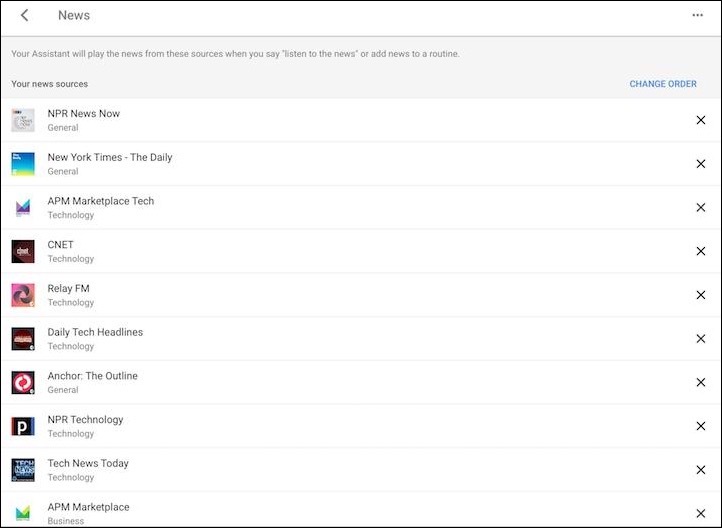 Subscribing to a podcast is similarly straightforward: ask Siri to “subscribe to the TidBITS podcast.” That adds the TidBITS podcast to the Podcast app’s library for future consumption. From that point on, episode playback on the HomePod and on iOS devices is supposed to be in sync. Pause on one device, and you are supposed to pick up where you left off on the other. In practice, I found this feature to be a bit hit-and-miss, but I suspect Apple will improve it over time. The HomePod does not support third-party iPhone podcast apps such as Overcast and Pocket Casts, so devotees of those clients must forgo tight HomePod integration. You can always stream podcasts from apps to the HomePod via AirPlay, though. What about the competition? On Echo devices, Alexa fetches podcasts from the TuneIn service. Ask the assistant to “play (podcast name)” and the most recent episode of that show fires up. Pause and the show will later pick right up where you left off. You can also say “play previous episode” to go back through a podcast’s catalog. There doesn’t appear to be a subscribe option, but you can try your luck with third-party “skills,” which are Alexa add-ons that provide additional features. The AnyPod skill, among others, adds subscription capabilities. On Google Home devices, you can similarly crank up the first episode of a podcast by requesting a show by name (though the source of the podcasts is a bit unclear). But, again, there’s no subscribe option I can see. Apple wins this category, clearly. The HomePod’s integration with the Podcasts app on iOS devices lets users readily subscribe to podcasts and sync playback across Apple devices, two features that are key to a complete podcast experience. Apple just needs to smooth out some rough edges. Read Me a Book — If you have purchased audiobooks via the iTunes Store, you’d think these would play just fine on your HomePod. Nope, or, at least, not by asking Siri for them. “Sorry, I can’t play audiobooks,” Siri on the HomePod tells me. “HomePod doesn’t support audiobooks at this time,” Apple confirms. Seriously? This isn’t a total deal-breaker since I can play any of my iTunes-purchased audiobooks from my iPhone or my iPad to the HomePod via AirPlay. But still, for a $350 smart speaker, that’s low-hanging fruit left unplucked. What about the competition? Amazon is well-positioned here in that it owns Audible, an audiobook service, along with its Kindle ebook store. This means that, in many cases, users can alternate between audio and text versions of books — provided both versions have been purchased — without losing their places. Echo devices support this WhisperSync capability; to use it, ask for the book you were reading in text form on your computer, phone or Kindle earlier, and you’ll pick up right where you left off. Likewise, if you’re solely listening to the audio version of a book, ask Alexa for the title of your current book in progress. You can also just say “play an audiobook.” When I did that, Alexa dropped me right onto the spot in a sci-fi novel that I had last accessed about a year ago; it knew that I had been reading that book, even though I had forgotten all about it. Audiobooks are a recent addition to Google’s Play Store, a longtime source of ebooks. This means a Google Home device can play audiobooks once they’ve been purchased from that online storefront. Plus, audiobooks from Google tend to be more affordable than the Apple and Amazon equivalents. Audio syncing among devices works nicely, too. When I paused playback of “The Art of War” in my desktop browser and then asked my Google Home Mini to “play an audiobook,” Sun Tzu picked up precisely where he had left off. So who wins? The absence of Siri-enabled audiobook playback on the HomePod is a big disappointment that Apple should remedy soon. Amazon and Google handle this chore pretty well, but Amazon has the edge with its WhisperSync synchronizing feature and the fact that it’s integrated with Audible. Make a Call — The HomePod is an excellent speakerphone, but there’s a catch: you cannot start (or answer) calls on it by, for instance, asking Siri to “call my wife,” as you would on your iPhone. Once a phone call is in progress on an iPhone, however, you can switch to the HomePod (via the Audio button on the call screen) to continue the call there. The top of the HomePod turns green when it is on a call. The HomePod even lets you manage multiple calls. Touch and hold the top of the device to end the current call and answer an incoming one, to answer an incoming call and put the current call on hold, or to switch between calls. What about the competition? Amazon one-ups the HomePod by providing both Echo-to-Echo calling and calls between Echos and smartphones with the Alexa app installed on them. The Alexa app on the iPad and other tablets has also just acquired this capability. The Echo can call regular telephone numbers, too. Initiate such a call by asking for a contact by name, or voice-dial just about any mobile or landline number. The only exclusions are the 911 emergency number, international numbers, and premium-rate numbers — to call these numbers, users must purchase a $34.99 add-on gadget called the Echo Connect). The Echo line has one other obvious differentiator. Since two of Amazon’s speakers — the Echo Show and the Echo Spot — incorporate displays, video messaging is possible and has been implemented accordingly. Google Home devices are roughly comparable to Echo devices in that they can make hands-free voice calls to contacts, along with voice dialing of mobile and landline numbers. The Google speakers also offer a few additional bells and whistles. Calls to international and premium-rate numbers are supported without additional hardware, provided the users have set up paid-calling capability via either the Google Voice voice-over-IP service or Google’s Project Fi cellular service. The HomePod may be a high-quality speakerphone, but its inability to initiate or answer calls is a significant minus. Apple should enable this feature as soon as possible. For now, Google Home gadgets have the audio advantage with the most calling features, thanks to integration with Google Voice and Project Fi. They cannot do video, though, the way some Echo devices can. Send a Message — The HomePod can send and receive messages using the Messages app. Those who use Siri to manipulate the Messages app on their iPhones and iPads will be on familiar ground, so I will not go through a tutorial. Suffice it to say you can use your HomePod to send a message to a person or persons in your contacts, have new messages (from everyone or specific people) read to you, and so on. To enable Messages on your HomePod, you have to set up a feature called Personal Requests that’s also necessary for reminders and notes. The HomePod also supports third-party messaging apps, including Skype for iPhone, WhatsApp Messenger, WeChat, and Viber Messenger. The first time you use one of these, you will be asked to authenticate on your iPhone with a screen tap. I have recently become a casual WeChat user because of relatives using the messaging app abroad, where it is much more popular. The WeChat integration worked better for me on the HomePod. I was able to send messages once I’d authenticated on my iPhone. Sort of. First, I had to authenticate WeChat on the phone each time I sent a message. (I think it’s supposed to be necessary only once.) Also, in an odd twist, messages apparently were not sent on the HomePod itself, but instead on the iPhone. 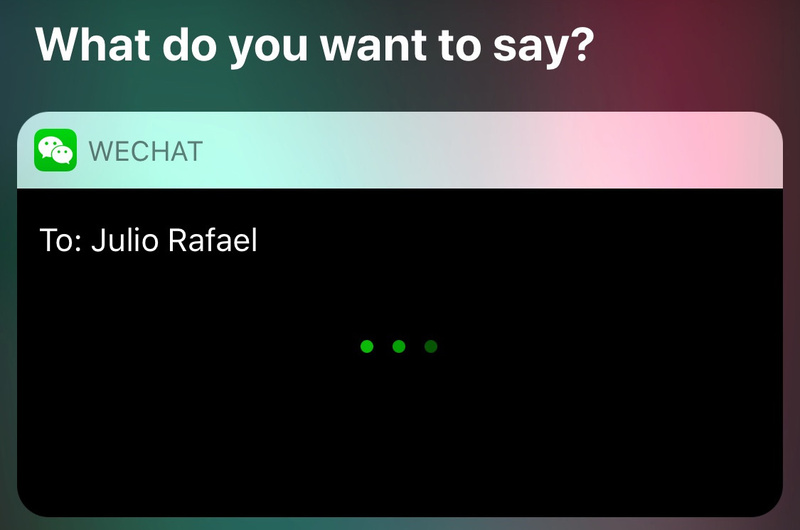 The HomePod seemed to hand off the task to the iPhone, where a WeChat composing field appeared. That’s not terrible, but WeChat integration has been billed as a HomePod capability. What about the competition? Amazon’s Echo devices recently gained the capability to send SMS messages, with a catch: users need to have Android phones. In the Alexa app on such handsets, there is an option to enable SMS voice sending on a companion Echo device. No such option exists in the iOS version of the Alexa app. As with voice and video calling, however, Amazon allows Echo-to-Echo messaging via Alexa. Again, this in-system messaging also works with phones and tablets with the Alexa app, including the iPhone and iPad. Google Home devices don’t officially support texting. I have seen a few workarounds, but they require an Android phone — a dealbreaker, again, for iPhone users. Add to Calendar — The HomePod has no Calendar support, for now, so it cannot inform you of your daily agenda or let you verbally create Calendar events. Bzzz! What about the competition? Echo users can connect their calendar to Alexa, which supports iCloud calendars. You accomplish this via the Alexa app on your iPhone, but you must first set up two-factor authentication. Calendars associated with Google accounts — including paid business (G Suite) accounts — also are supported. Google Home supports Google calendars, obviously. Unfortunately, these can only be generic accounts, not paid G Suite variants with personalized domain names. This limitation annoys me greatly since all my activity happens within such a G Suite account, where my longtime domain name lives. Amazon wins this category going away. It has the most robust calendar support that includes Apple and Google flavors. Apple is the big loser, and Google isn’t much ahead due to surprisingly limited Google Calendar support. Reminders, To-Do Lists, and Timers — Apple’s Reminders is an endearingly minimalist app, and now you can add items to it using your HomePod. As with messages, you must first turn on the HomePod Personal Requests feature. Once that’s done, verbally creating reminders or to-dos on the HomePod is straightforward, and much the same as with Siri on the iPhone. You can add reminders to lists and check off completed items, ask to be reminded when arriving at or departing locales you specify, ask to be reminded at a future point in time, and create recurring reminders. The HomePod also lets you set alarms and timers, but they do not appear to sync in any way with the Clock app on the iPhone. What about the competition? Amazon’s Echo devices do reminders in much the same way the HomePod does. Alexa-initiated reminders can include time elements. Recurring reminders are available, too. Location reminders are not supported. You can set alarms, make shopping lists, and create to-do items. The Echo supports multiple, overlapping timers, whereas Siri can only do one timer at a time. You can manage your reminders using the Alexa app on your iPhone or iPad, too. Amazon lumps this capability together on the app with alarms and timers. Elsewhere in the app is a place to manage shopping lists and to-do items. In addition, Amazon has support for third-party list apps such as Any.do, AnyList, Cozi Lists, Picnic, and Todoist. Users can choose to manage their Alexa lists in any of those apps by default. Google Home devices handle reminders similarly. For instance, you can create a recurring time-based reminder, ask to review all your reminders, and even delete reminders individually or en masse. Location-based reminders are not supported. To get reminders on an iPhone (and even the iPad now), download the Google Assistant app, and turn on notifications. Google stores reminders created with Google Assistant in Google Calendar. Like the Alexa app, the Google Home app includes a separate shopping-list feature. It also can be set up to support the third-party Out of Milk service. Google Home, like the Echo line, supports multiple and overlapping timers. Apple appears to have the most full-featured reminders support — including location-based reminders, which its competitors lack for now. Also, its simple Reminders app is nicer than the cluttered Alexa app, which has to handle a lot of other duties and can be daunting to use (cough — iTunes — cough). But Amazon, in addition to its default list-making features, has good support for third-party lists apps. In addition, for those willing to tinker a bit, the IFTTT (If This, Then That) automation service can connect Alexa or Google reminders to Apple reminders. Create a Note — Just as the HomePod works with the Messages app for messaging and the Reminders app for reminders and to-dos, it can add notes to Apple’s Notes app, though this tends to be frustrating to pull off using Siri on the iPhone. As with messages and reminders, you must first turn on Personal Requests. From then on, you can create a note with a title, an untitled note (which makes the first bit of the note text into the title), or add to a previously created, titled note. As with messaging and reminders, the HomePod supports third-party apps — or, at least, one app in the category, Evernote. Linking my longtime Evernote account to Siri was painless, for the most part. So was creating notes in Evernote using Siri commands. What about the competition? Neither Amazon nor Google has given their voice assistants decent notes support, but there are workarounds. Scrounge through the vast library of Alexa skills, and you’re bound to find something useful, such as the EverPad skill for adding a note to Evernote via Alexa. Likewise, the IFTTT automation service offers applets for note-related actions, like the Evernote action to create a note by telling it to Google Assistant. But the lack of native Amazon and Google support is a disappointment. I’d like to see Google Home support for Google’s terrific Keep notes app, for instance. Tell Me About My Day — A smart speaker really shines if it can take a variety of information nuggets — news reports, weather forecasts, traffic updates, upcoming calendar events, and so on — and consolidate them into a personal report that can be invoked with one spoken command. The HomePod can kinda sorta do this via the previously mentioned collection of short podcasts. But setting that up takes time and effort and yields results that are often unpredictable. Amazon and Google are far ahead of Apple here. Amazon’s Flash Briefings can also include a weather forecast. Amazon helpfully includes a Today’s Forecast item for this purpose. 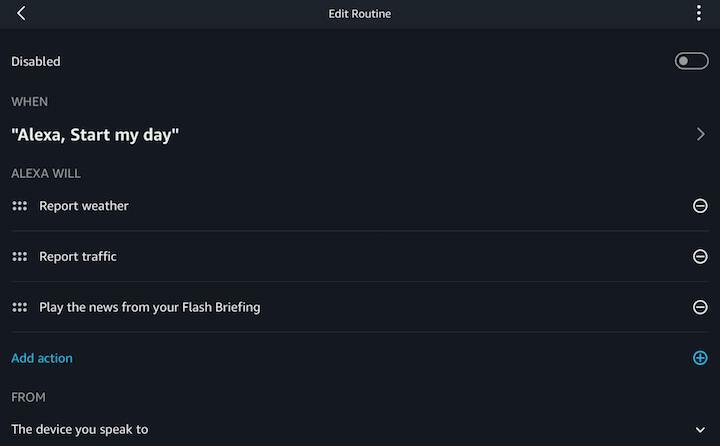 In addition to the Flash Briefing, Echo devices have an “Alexa, start my day” feature (Amazon calls this a “routine”) that can consolidate several elements — including traffic and weather along with the Flash Briefing — into one combined offering. 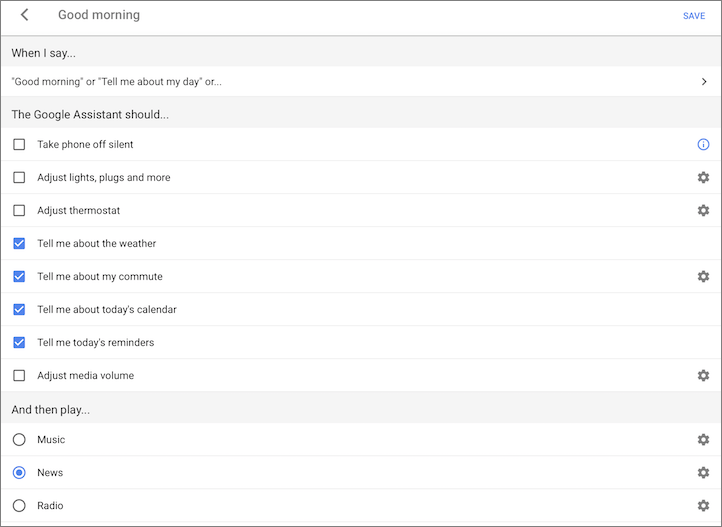 Similarly, Google provides a Good Morning feature — what it also calls a “routine” — that is richly complex and customizable. Via a series of checkboxes in the Google Home app, users can configure the Google Assistant to offer information about the weather, calendar events, upcoming commutes, and so on. A Google Home routine can also, optionally, play the news, the user’s choice of music, a radio live stream, a podcast, or an audiobook. All of the above can then spew from the Google speaker with a single request to “tell me about my day” (or “good morning” or “I’m up”). It’s a close call here. Amazon and Google excel with respective about-my-day offerings. Amazon’s variation is structurally a bit more limited but has much more to offer content-wise if you count as one of the elements the Flash Briefing, with its potentially vast amount of information. Picking an Overall Champ — So how do these three companies’ smart speaker lines compare in the end? Amazon is the overall winner, with 23 points. That’s not too surprising, given that Amazon was first out of the gate with a smart speaker and thus has the most experience in the field. Amazon also sells a wide selection of Echo devices, giving it more capabilities than Google and Apple. Google comes in second, with 18 points. Again, that makes sense, given its head start on Apple. As with Amazon, the original Google Home has now been joined by siblings that offer different price points and audio capabilities. Apple comes in third, with 15 points. However, that’s deceptive, since the HomePod struck out completely in two categories — audiobooks and calendars — where Apple should be able to add functionality. Adding multiple user support, which was the HomePod’s other goose egg, would likely be harder. Siri understands quite a few calendar-related commands in iOS and macOS, for instance, so why not on the HomePod? And why no audiobook support? If Apple were to bring those features in and improve the areas where the HomePod scored only 1 point, like voice calling, it would be right in the thick of things. That’s especially true because, in four of the categories where it does compete, the HomePod scored 3 points. Although smart speakers have been out for a while now, the race is in many ways still getting started. All the participants have distinct strengths and weaknesses at the moment. In other words, even though the HomePod was late to market and is trailing overall, it has a number of bright spots, and Apple has clear marching orders regarding what to add and improve. By the end of 2018, with appropriate changes and the promised stereo and multi-room audio features, Apple could catapult the HomePod to the top of the heap. That said, this is a race, and Amazon and Google aren’t sitting still. So Apple will need to do more than just catch up in the existing categories. Time to rev up that innovation engine, Apple! Be nice to have an article with info about home automation and extendability. For example, I have lots of IFTTT applets for all sorts of controls for stuff, adding things into apps like Day One, weather, and so on. I have very little desire for these devices...indeed a plugged in iPad mini in my house WILL respond to my "hey siri what's the weather" and Maybe "Play Slow Train by Bob Dylan" but my mom has a google thing and a friend asked me to design a feature for his Alexa (another dev program for me) - however I have to say one of the best features of the eMate (circa 1998) was to open it up in the morning and hear her say "No Meetings Today, No Events today". Just opening the lid invoked that - so i have a small bugaboo about invoking your device by name.